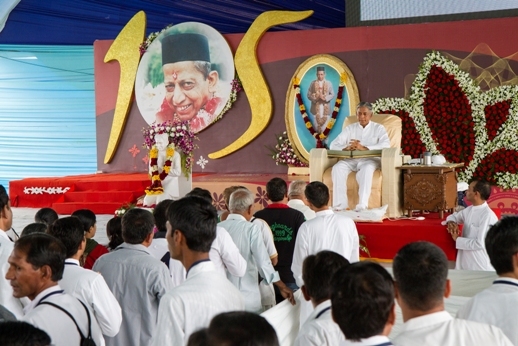 Param Pujya Dada Bhagwan's 105th Janma Jayanti (birth anniversary) Celebration was held in Bhavnagar, Gujarat (India) from 23rd Nov to 27th Nov, 2012. 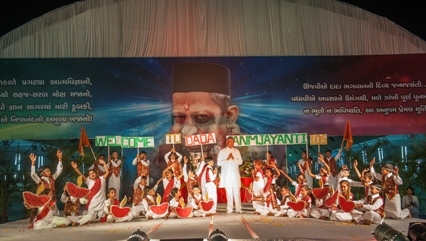 The celebration began with a grand dance performance by the Little MHT (Kids activity) of Bhavnagar. This was followed by Shri Simandhar Swami's and Param Pujya Dadashri's aarti and a small speech by Pujya Deepakbhai where he explained the importance of the event. In parallel to Spiritual discourses, there were also â€œTheme parkâ€ where shows exhibited on Banyu te j nyay (whatever happens is justice), Documentary of Param Pujya Dada Bhagwan-Pujya Niruma & introduction to Gnanvidhi. â€œChildren Park for kids was also set up where shows on magic eraser, magical glasses, puppet shows, live stories and hands on experiences on avoid clashes were organized. 27th Nov was Param Pujya Dada Bhagwan's 105th Janma Jayanti. On this day Pujya Deepakbhai gave blessings to thousands of spiritual seekers and followers to remain in pure soul and to see the world with a flawless vision. The evening ended with bhakti (devotional song) where followers were mesmerized by Pujya Deepakbhai's singing. The event ended with a special satsang with 2000 sevarthi(honorary volunteers) where they shared beautiful experiences and expressed their gratefulness for contributing to the event.